As sales of of music and videos from the iTunes Store decline, Apple's App Store continues to grow, and is on pace to account for most of the company's online services revenue by the end of this year. New data released on Wednesday by Morgan Stanley obtained by AppleInsider estimates that last quarter the App Store was 41 percent of Apple's services revenue, while iTunes accounted for the remaining 59 percent. But that balance of power is expected to shift, and quickly. Analyst Katy Huberty projects that by the fourth quarter of calendar 2014, the App Store will represent 53 percent of Apple's online services revenue. That would leave the iTunes Store with a 47 percent share— a number that she expects will continue to shrink as music sales decline. 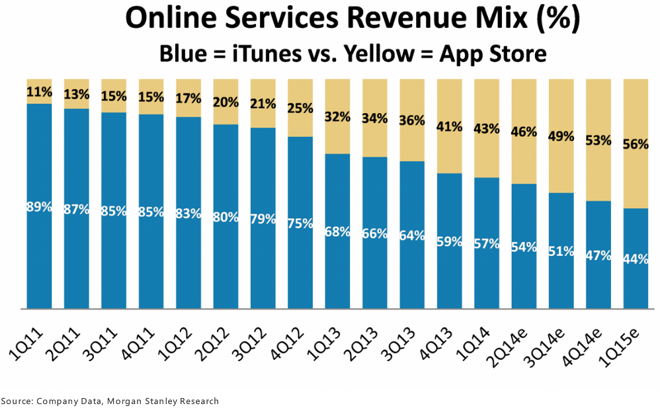 Morgan Stanley's research suggests that iTunes Store customers are simply spending less than they used to. Huberty believes those dollars are now going toward competing content providers including Spotify, Pandora and Netflix, as users opt for recurring payments to access content rather than purchasing specific songs or videos. But while iTunes Store shoppers have been spending less on content, users have been spending more on downloadable software on the App Store. 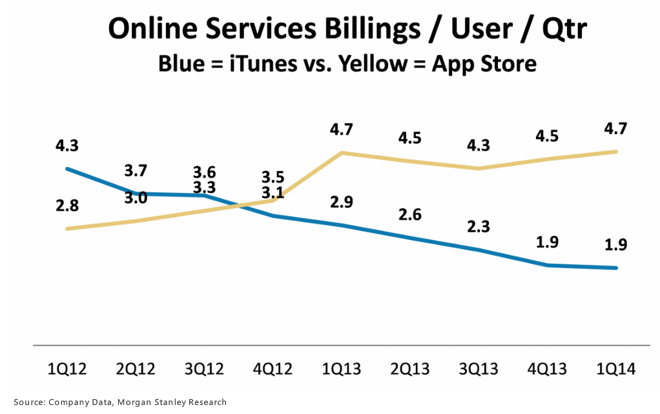 Morgan Stanley's data suggests that the App Store passed the iTunes Store in average billings per user in late 2012, and the disparity between the two has only increased since. Huberty said that Apple's online services are underappreciated by investors because they accounted for less than 6 percent of the company's revenue over the last 12 months. And while monetization of online services is declining— down 24 percent year over year in the first quarter of 2014 —Huberty sees upside in the strength of Apple's App Store. Specifically, she noted that the iTunes Store is estimated to have about 15 percent operating margin, while the App Store has much higher estimated margins around 46 percent. She believes that the growth of the App Store and its strong margins could add 10 basis points to Apple's total company-wide operating margins for calendar 2014. Looking forward, Huberty also sees potential for future catalysts in the online services realm, with the possibility of a subscription streaming music service chief on her list. Some believe that the Beats Audio service could play an integral role for Apple's services revenue, if the rumored acquisition of Beats Electronics comes to pass. Beyond music and content, Huberty believes Apple could enter the mobile payments space to further monetize its 800 million active iTunes accounts. And she sees a rumored "iWatch" as another potential platform where Apple could offer an App Store and take a cut of sales.